For hundreds of years, Halloween has existed as the one night per year when anyone can become anything, and it’s totally acceptable to leave the house looking like you were dragged out of the ground. From adults, to children, to even common household pets in pumpkin attire, you can’t turn your head without seeing a host of ghosts, creepy crawlers and DIY pop culture icons on that ghoulish October eve (you know the excitement is real when the national average Halloween spending per shopper reaches nearly $75). Each year sees the age-old classic repeats—often with a modern edge—like witches, vampires and any type of imaginable animal. We’ve also added a consistent stream of new contenders to the ranks as pop culture trends continue to transform (here’s looking at you, Elsa from Frozen). Unsurprisingly, some of the most popular and often used costume inspiration comes from the styles and trends of decades past—the classic poodle skirt, hippie garb and rocker attire will always reserve a warm place in our heart. But what might people have dressed up in for Halloween when these iconic decade-inspired costume staples were nothing more than everyday streetwear? After all, popular culture was only just becoming viral in the 1950s with the introduction of the television as a common household staple. As we gear up to celebrate the season 21st century-style, we’re throwing it back to the old-school days of costuming for some good ole fashion…well, fashion. After World War II, Halloween costume manufacturing became a booming business, with huge companies like Ben Cooper turning popular TV show characters like The Adventures of Superman, Davy Crockett and Zorro into the new witches, ghosts and goblins of ages past. Cowboy attire and especially superhero masks as seen in comic books at the time became huge among the trick-or-treating crowd, while many stuck with the classics, turning to homemade witch, ghoul and clown costumes as the perfect fright night ensemble. 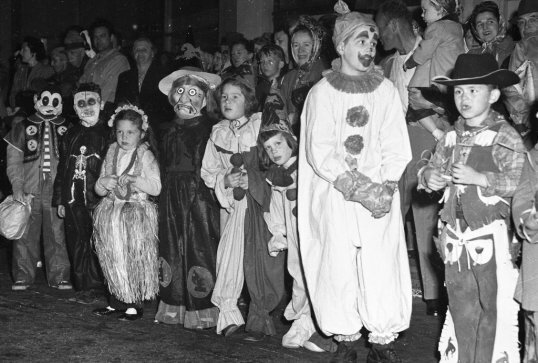 The growth of pop culture into the 1960s and 1970s saw rubber and plastic masks becoming the face (pun intended) of the Halloween costume market. Unlike today, where the outfit is everything, the ensemble from the neck-down became of second importance to the expanding variety of face-obscuring character masks hitting the shelves. Popular franchises like Peanuts, Star Wars, and Planet of the Apes were making their grand debuts during this time, paving the way for some of today’s most popular go-to themes. The 1980s saw a turn toward the more modern concept of dressing up, with pop culture icons being at the forefront of trendy Halloween garb—this is when Hulk Hogan and Elvira became the king and queen of the costume inspiration board (and now, of the most hilarious retro trends). The cheesy manufactured masks were largely dropped, but you might have seen some new masked figures running about, as superheroes were, of course, heavily popularized during the time. Arguably one of the most fun throwback decades for flipping through old Halloween costume photos is the ’90s, when ever-popular childhood staples like Barney and Aladdin and Jasmine were rising in the ranks. The Teenage Mutant Ninja Turtles also made a huge splash into the scene in 1993, despite the fact that the franchise originated in the 1980s. One of the most popular—and terrifying—Halloween costumes to this day got its origins in the late ’90s, when Scream hit theaters and sent a new scare-fare trend surging. The early 2000s round out the Halloween costume experiences of old, when the name of the game in the dress-up world heavily revolved around children’s culture figures, most popularly The Wiggles and Bratz. What are today’s hottest trends in the Halloween department? Tell us what disguise you’ll be donning in the comments!